I don’t generally frequent Costco simply because I have nowhere to store a 60-roll package of toilet paper and my refrigerator isn’t big enough for condiments by the gallon. That said, I have always wondered how they came up with such an odd set of decimal pricing. Doing a little hunting around the interwebs, I see this has been tossed around for a while now. Enjoy! 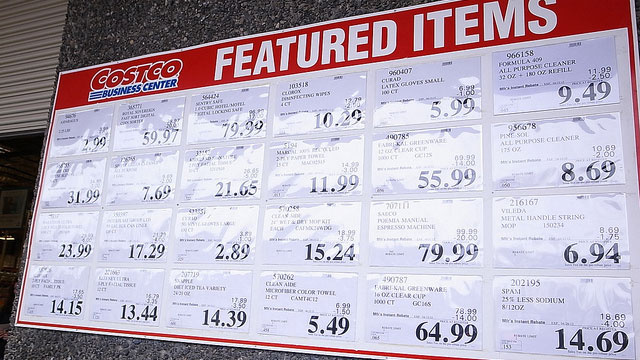 The price signs at Costco will clue you in to the best deals and help you save even more money at the warehouse store. Odd pricing, such as 79¢, 49¢, or 89¢: These indicate specially priced items that Costco got a deal from the manufacturer. Rapoport says these can be better deals than at other stores, but not usually better than the 97¢ markdown. An asterisk* on the upper right side of the sign: The item won’t be reordered. 88¢ or .00 endings: Manager markdowns. Sometimes the company uses these to move a product very fast. While you’re at it, don’t forget to check the bargain aisles as well. Rapoport’s article has a ton of other insider pricing tips and tricks to help you become a smarter Costco shopper, so be sure to check them out at the link below.